Fairbanks Ranch is one of Rancho Santa Fe's most family friendly luxury home neighborhoods with community amenities and 24 hour guard gated security. Included below are homes for sale in Fairbanks Ranch Rancho Santa Fe. If you would like more information on any of these Fairbanks Ranch real estate listings, just click the "Request More Information" button when viewing the details of that property. We can provide you with disclosures, past sales history, dates and prices of homes recently sold nearby, and more. And, if you haven't already, be sure to register for a free account so that you can receive email alerts whenever new Fairbanks Ranch houses come on the market. Fairbanks Ranch once featured on "The Lifestyles of the Rich and Famous," is divided by San Dieguito Road into two guard gated communities, North Gate and South Gate. Security for both neighborhoods include an electronic surveillance system and a computerized system that links every home to the main gate for immediate emergency response, as well as 24 hour roaming patrol. There are six hundred eighteen home sites on one thousand two hundred forty acres in Fairbanks Ranch. Architecture ranges from English Tudor, Country French, Spanish Mediterranean, Ranch, and Tuscan. Lot sizes range from 1.5 acre to 10 acres. Many families prefer the North Gate because of the amenities located behind the North Gates. The Fairbanks Riding Club is a ten acre equestrian center where residents can board with a fifty seven stall barn, three arenas, six turnouts, and three miles of fenced horse trails. If you don't own yet, Fairbanks families can become acquainted with horseback riding on the riding school ponies and lesson horses. There are pony day camps and Horsemanship Lessons throughout the year. Within Fairbanks there is seventy five acres of dedicated open space there is a private lake replete with paddle boats and a row boat. Residents can fish catch and release as well as enjoy the beauty of the bird sanctuary island with swans. On the Eastern shore of Fairbanks Lake is the community clubhouse and patio. 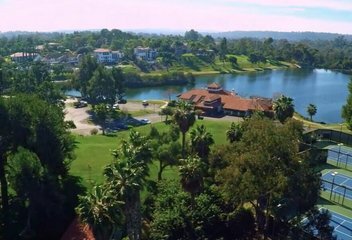 The clubhouse is where residents gather for social events & activities held throughout the year such as Coffee By The Lake Friday-Sunday, Karate for children on Thursdays, Tennis & Surf Camp in the summer, Yoga and Ladies Stretching Group, and Meet Up At The Park. Tennis enthusiasts take advantage of the five tennis courts, three with lights for evening play adjacent to the club house. Fairbanks has their own Tennis Pro Darin Bassett, offering private lessons with community tournaments. Residents also belong to the nearby Rancho Valencia ranked the number one Tennis Resort by Tennis Magazine. Below the dam and overlooking the waterfall the old historical pump house is home to the community library. Nearby is the community park with playground, barbecue, two shaded picnic tables, sand volleyball court, and half basketball court. There is also a stream and trail leading to the equestrian center with a fitness course and nine hole putting green. The North Gate also has a private entrance through the back gate to Solana Santa Fe Elementary School. The middle school and high school for Fairbanks Ranch are Earl Warren Middle School and Torrey Pines High School. The Fairbanks Ranch Country Club is a by invitation only member owned club. There are four types of membership Golf, Tennis and Social, Tennis Only, and Jr. Executive. One of the distinct characteristics of the Club is that there are no homes built on the golf course. The Fairbanks Ranch Country Club amenities include 3 courses with 27 holes of golf, The Valley, The Oaks, and The Ocean. There is also onsite dining, 8 tennis courts (one clay composite surface), fitness facility, and an opulent clubhouse. Fairbanks Ranch Country Club has an extensive social calendar of holiday events, fashion show luncheons, monthly wine dinners, and cooking classes. Fairbanks Country Club membership is now reciprocal with Bay Clubs.